Curry Leaves Rice is a wonderful variety rice and also perfect for lunch or even for lunchbox. 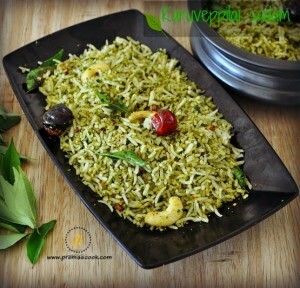 Whenever I bought fresh curry leaves and immediately thought to make curry leaves rice.Cooking with curry leaves is amazing and it is so flavourful and good.We usually have lunch with karuveppilai sadam and simple vadam.Before going into the recipe check here how to cook basmati rice to make perfect karruveppilai sadam ,cooking rice is very important because if the rice is too mushy this variety rice wont be nice. Rinse curry leaves well and dry it completely and keep it ready.Dry roast Curry leaves,Coriander Seeds,Dry Red Chillies,Channa dal,Whole Black Pepper till golden brown.Then add curry leaves and saute for 3-4mins until the color starts to change.Add required salt.Switch off.Cool down and grind it to a coarse powder,Set aside. In a pan heat oil and ghee, add mustard seeds,chilly and urad dal, once it crackles add broken cashews and fry till golden brown. Cook rice ,Check here how to cook rice and make it.Fluff the rice add gingelly oil. Now add the curry leaves powder and tempering, mix well.Serve hot / warm with papadam. 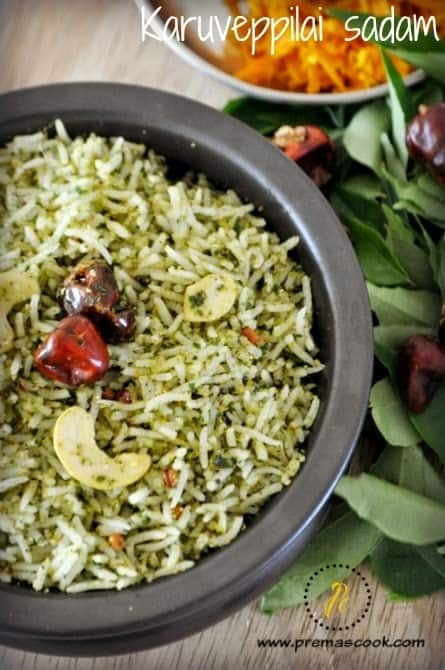 You can make this curry leaves powder in bulk and store in a air tight container,when ever you need just mix it with rice. Nice and flavourful ! I too try to use curry leaves in rice, salads and chutneys when they are fresh. 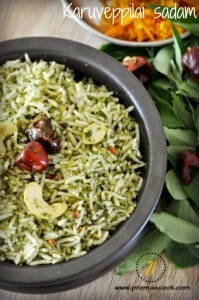 yummy delicious curry leaves rice.